The 2014-15 academic year ushered in several big changes for the Digital Rhetoric Collaborative! With a major site re-design came an increased focus on ensuring the blog was engaging with the kinds of multiliteracies it heralds. While continuing features like the Webtext-of-the-Month, Wiki Wednesdays, and semester-long Blog Carnivals, new features like DRC Chat on Air, Reflections from the Cloud, and Tool Review Tuesdays were introduced. 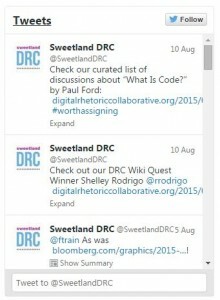 When I think back on my year at the DRC, I can’t help but think even further back still: to the first DRC posts I read. 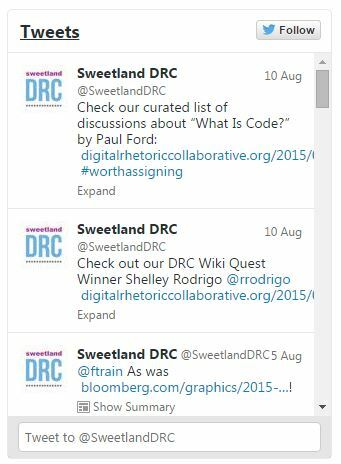 Although I honestly can’t even remember how I discovered the DRC, I can still remember reading the site’s first blog carnival on defining digital rhetoric and knowing that I wanted to apply for one of the graduate student fellowships. What I saw from that first blog carnival was the expansive room for more conversation and collaboration around digital rhetoric. I certainly saw that potential for more conversation fulfilled in my time as a fellow. Not only did I work to build in parts of the conversation that I thought could use greater development, but I also spent much of the year humbled by the work of the other fellows, amazed by their recommendations for innovating and making our site an even more interactive space. 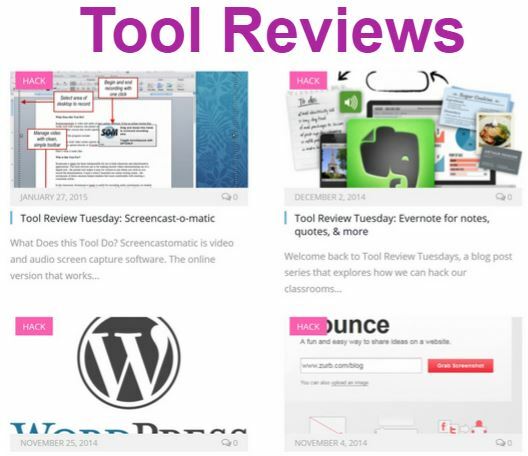 With the growth of the Wiki, the production of Google Hangouts on Air, the inclusion of Tool Reviews, and the discussions of online pedagogy, I could see the conversations and community around digital rhetoric growing ever larger. I’m excited to spend another year as a graduate fellow and to continue not only expanding these conversations more, but building partnerships with other digital rhetoricians. Part of the challenge of creating digital rhetoric is differentiating its content from the myriad other online resources. It can be challenging to find and invest in spaces when there are so many to choose from. That said, part of my goal as a digital rhetorician – and a scholar and a public humanist – is to learn how to do that outreach more effectively and build an even stronger community. I’m not entirely sure how to express my gratitude for the opportunity to be involved with the DRC; there are so many individuals to thank for giving me a chance to be a part of this space. I look forward to continue defining, exploring, and reaching out to all kinds of voices on the Web next year. This has been an exciting year for me. Hot on the heels of transitioning from full time writing center administrator work to a PhD program, I jumped into working with the DRC as a graduate fellow. It’s made for a memorable first year back in graduate school. Because so much of my writing center work involves engaging people in dialogue, my goal for the year was to find ways that the Digital Rhetoric Collaborative could invite the community to conversation through multiple modes. 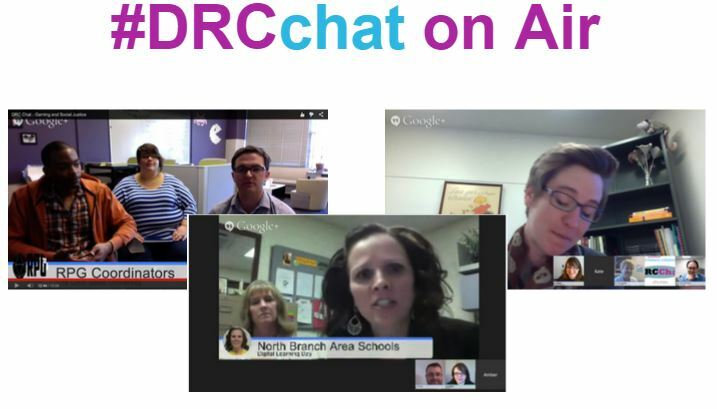 Highlights of the year included hosting the #DRCchat Google Hangouts on Air, where we invite the community to be part of the conversation taking place in text on the blog, and co-organizing #DRCchat twitter chats, which allow for real time engagement. 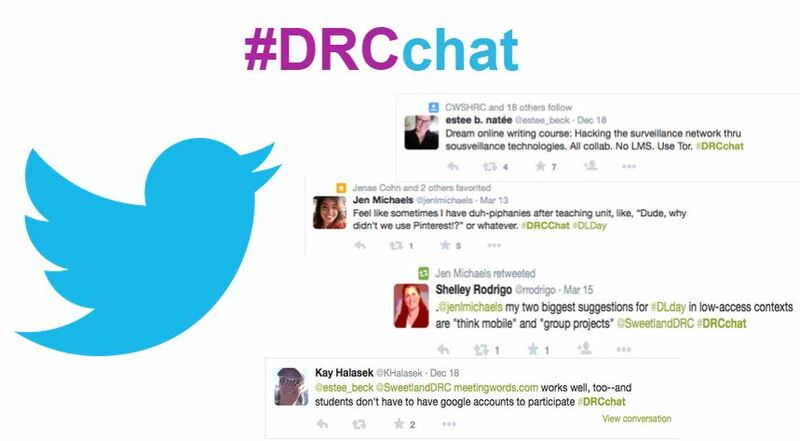 You can find an archive of the #DRCchats here. I’m looking forward to expanding that conversation even further in the coming year. My fabulous colleague, Jenae Cohn, and I are planning a series that will investigate different ways to teach and the DRC. We’ll be working closely with teachers to explore ways the DRC can be used in the classroom, and we’ll be featuring stories of those collaborations. Wow. What an amazing year at the DRC! Thinking back to last August, it’s nearly impossible (for me at least) to even account for all we’ve accomplished this year. Working with all of these fabulous fellows meant that there was always something going on, and it was always spectacular. I continue to be impressed with the energy of the people working at the Collaborative, and how that energy translates into the site. 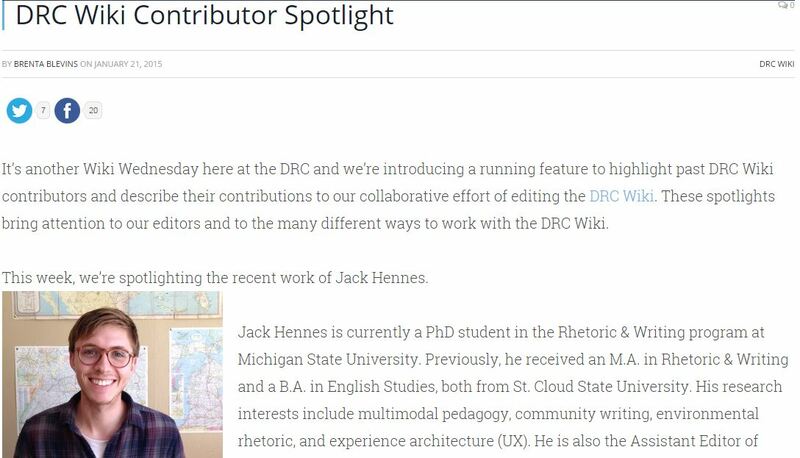 Alongside Brenta Blevins, I spent a lot of time working to develop and promote the DRC Wiki, to help others in our community become more aware of and participate in this section as a resource and writing space. 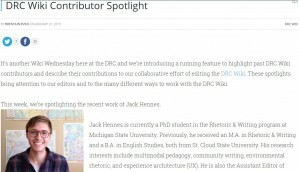 We got a lot of this work done through our weekly Wiki Wednesdays feature, which focused on ways in which the DRC Wiki (as well as wikis in general) can help support the work of digital rhetoric and writing scholars, teachers, and learners. 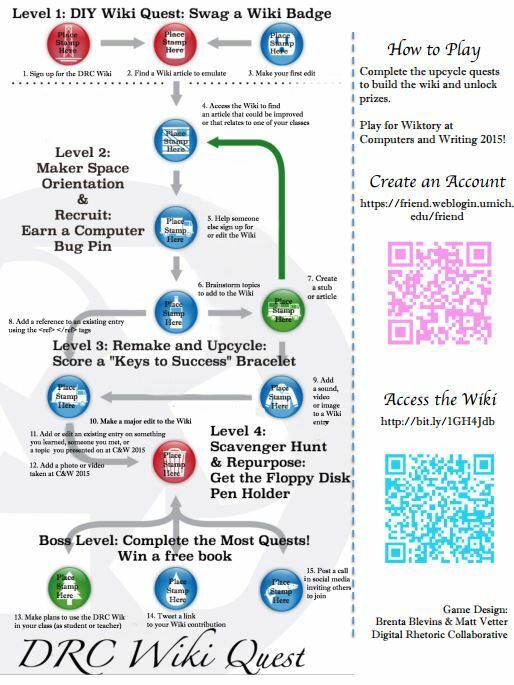 This year we also unveiled a “gamified” participation initiative for the Wiki, the DRC Wiki Quest Game, which was introduced for the first time at Computers and Writing 2015. I’ll let Brenta talk a little more about that, especially since it was such a collaborative endeavor. But looking back at these projects helps me realize why the DRC is so important. We need more initiatives that can translate our work in ways that are accessible to larger publics outside and beyond the discipline. And this, to a great extent, is what the fellows are engaging in- translating the work of digital rhetoric across different boundaries, communities and (multi)literacies. I won’t be returning as a graduate fellow. 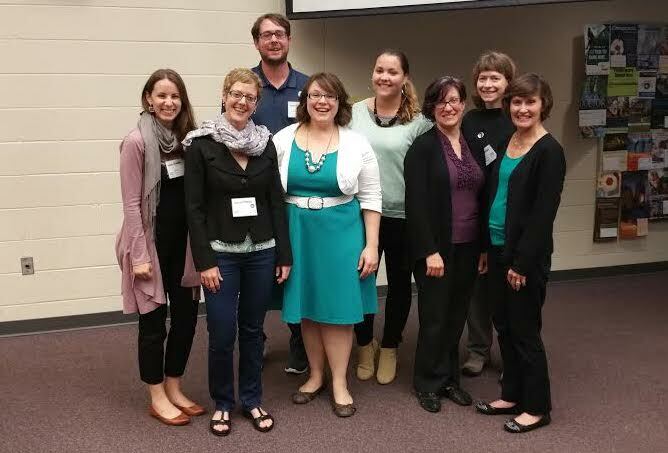 I defended my dissertation and finished the PhD last spring (Woohoo!) but I do want to send a big THANK YOU out to everyone working with or contributing to the DRC. This has been an incredible year. I am endlessly thankful for the opportunity to be a DRC fellow these past two years. I’ve loved the opportunity to work with scholars with diverse research and teaching interests on a wide variety of projects. I have learned so much. This year was an exciting one. I especially enjoying seeing how initiatives we started in Year One — like Hack and Yack — evolved to address new trends and issues and meet the ever-changing needs of our readership. 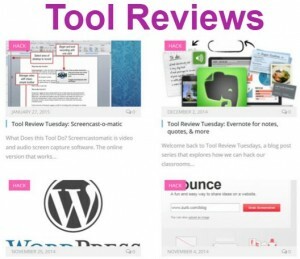 Our Google Hangouts on Air, Twitter Chats, and Tool Review Tuesdays have enabled us to have more conversations and provide more practical guidance to help scholars and teachers engage with technology. While Year One seemed to be a lot of throwing ideas up on the site to see what would stick, Year Two has involved a great deal of refining and expanding the content and forms we feature on the site. In addition, I’m delighted to see our Webtext of the Month feature continue, and I look forward to being inspired by new texts that continue to challenge our notions of reading and writing in digital, networked spaces. This year reinforced for me how important collaboration is to innovation, communication, and learning. At times, the fellows worked in pairs or small groups; at other times, we all worked together to think through a situation or develop strategies to meet our goals. We brainstormed together. 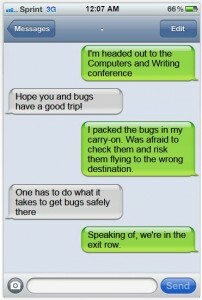 We emailed back and forth. We supported each other. In the process, we grew our readership. 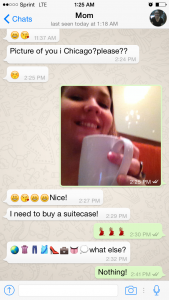 We developed new and exciting content. We extended conversations beyond our site to Twitter and classrooms across the country. It really was something to be part of such an energetic, thoughtful group. 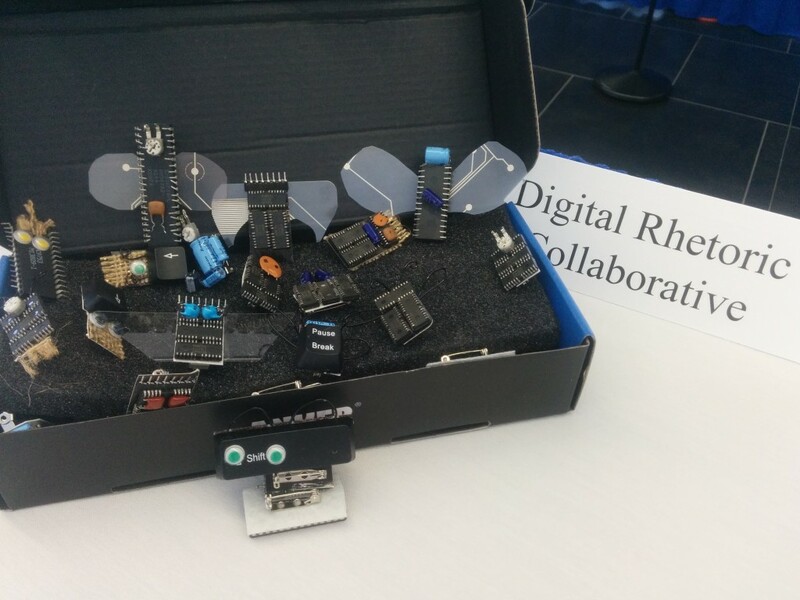 As a returning fellow for 2014-2015, I had the opportunity with other fellows to put the collaborative in the Digital Rhetoric Collaborative. Matthew Vetter and I continued the Wiki Wednesday initiative from spring 2014 through the 2014-15 year, exploring wikis in the classroom from a variety of perspectives. 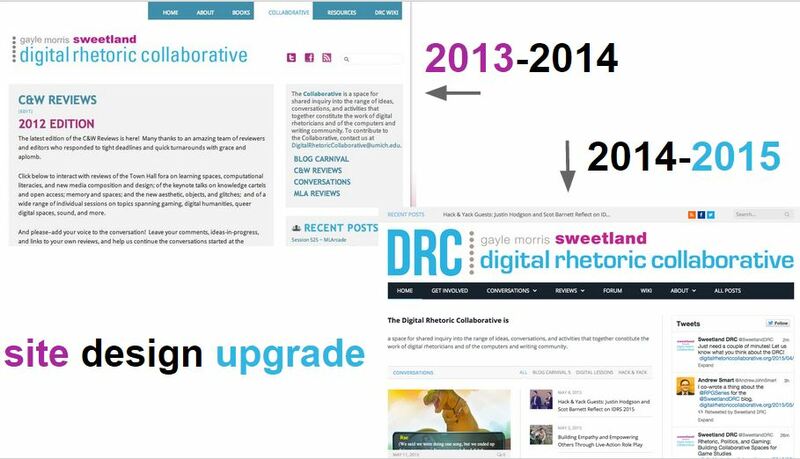 This year, we emphasized the DRC Wiki as a differentiated space for students in particular to collaboratively build knowledge in the Digital Rhetoric Collaborative wiki, a student-supportive public space. The number of DRC Wiki editors and contributions increased this past year. It was exciting to see Simone Sessolo and Elizabeth Davis lead projects for contributing content around their classes’ specializations. We had the opportunity to recognize some of our DRC Wiki contributors. 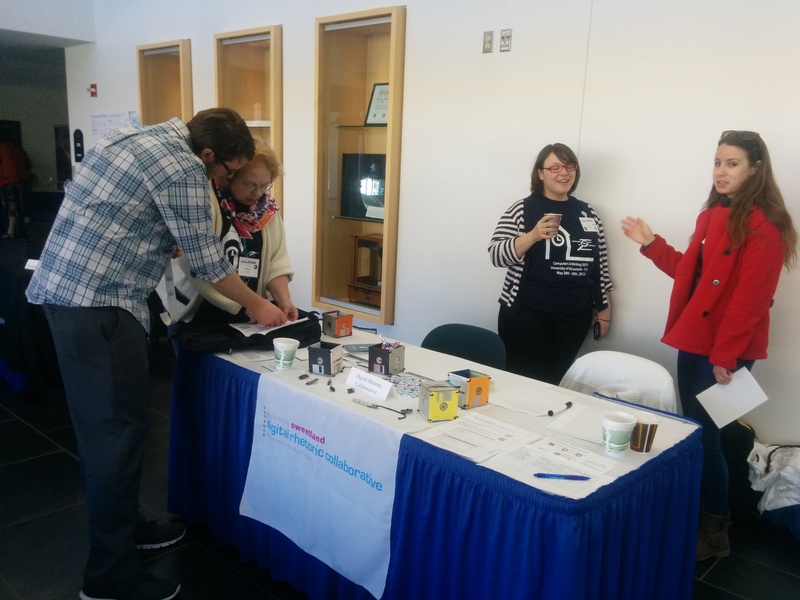 Matt Vetter and I collaborated on another effort to support participation in the DRC by organizing a wiki edit-a-thon at Computers and Writing 2015. Because attending a conference and working with digital activities for the first time can be overwhelming and anxiety-inducing, Matt and I created the DRC Wiki Quest by designing a game and game board with scaffolded skill-building tasks to provide a playful structure for editing the wiki beyond just a single editing session. Participants in this “extracurricular” activity gained not just new skills and ways of thinking about wiki editing activities, but also could earn rewards of upcycled obsolete electronic parts (from floppy disk pen holders to “bugs” made out of computer chips), providing us the opportunity to think about reusing content, whether physical or conceptual. 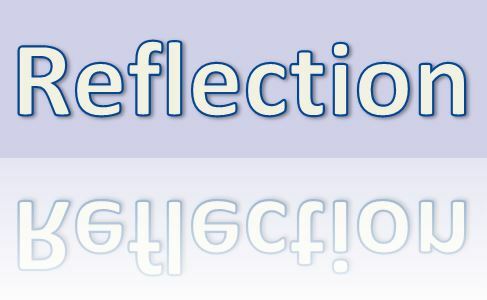 In the Reflections from the Trenches in the Cloud series, I had the opportunity to share what it was like in my first year as an online teacher, including my thoughts on pedagogy in the online class, the temporal differences between the face-to-face classroom and online classes, resources for instructors and students in online classes, and the role of reflection. I had the opportunity to collaborate on this series with Fellow Paula Miller, who contributed to this series about the role of online writing centers, and librarian Jenny Dale, who identified ways librarians and instructors could partner for online instruction. The great thing about my time with the Collaborative has been collaborating with fellows and scholars from all over in our virtual meetings and with our virtual presences on the web, collaborating on everything from sharing calls for participation, social media posts, or our Webtext-of-the-Month posts (where we could enthuse about webtexts like “What Is Code?” and teaching resources for it). 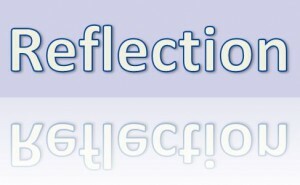 The Fellows’ work was supported by Anne Ruggles Gere, Naomi Silver, Merideth Garcia, and Aaron Valdez at the University of Michigan and so many others in the digital rhetoric, digital humanities, and computers and writing communities who contributed content and interacted with us on the site and through social media. 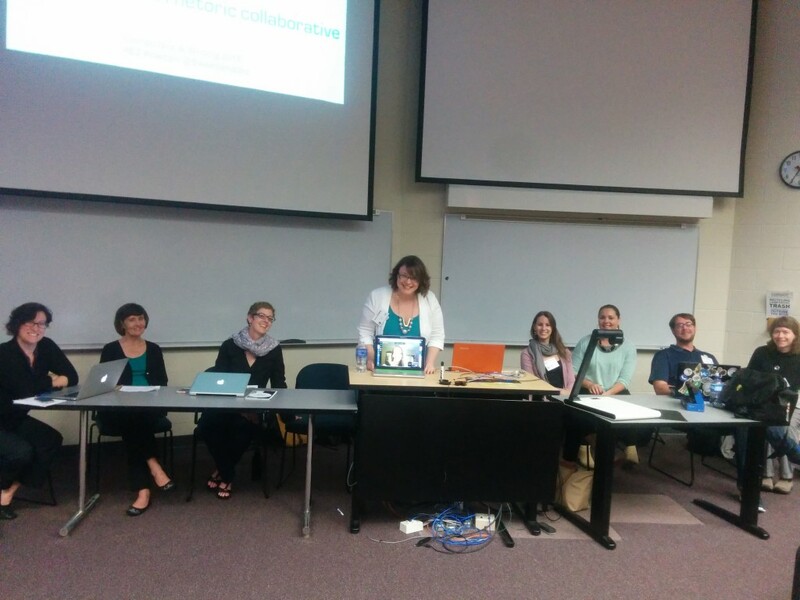 I look forward to seeing where the 2015-16 fellows proceed with the Collaborative! I’m so thankful and excited to be a part of the DRC community. For the last two years, I’ve had the opportunity to collaborate with other fellows, teachers, and researchers across the country, continuing to build onto the resources and conversations shared on the DRC site. I had the unique opportunity of starting my fellowship with the DRC the same semester that I started graduate school at Michigan State. As many people might attest, the first year of graduate schools leads to so many questions–what am I doing here? what am I interested in? what is expected of me in the academy? who do I want to be? why am I even doing this?? For me, the DRC provided a space to try out potential answers to these questions while having the chance to learn from the experiences of others. I started by listening as much as I could, helping to coordinate our DRC conference reviews so that I could learn about the places, people, and conversations around me. Eventually, as I progressed in my graduate program and began the second year as a DRC fellow, I became more comfortable merging my still developing research questions with the conversations represented on the DRC site. Perhaps most notably, as I began to think more about the connections between multilingualism and multimodality, I decided to ask other more experienced scholars for their input, leading to our Blog Carnival on this topic. I was and continue to be so amazed by the generosity and mentorship I gained through this experience from our blog carnival contributors, leading to relationships and collaborations that have stemmed beyond any single blog post. In short, I am thankful. Thankful for the opportunity to be a part of this community and for the chance to ask questions and try new things in a welcoming, open space. I think that one of the scariest things about being a “researcher” or “scholar” is the isolation we often feel as we sit in coffee shops or offices thinking and writing. To me, the DRC helped me acknowledge the humanity of our work, helping us connect, share ideas, and ask questions together. Jenae Cohn is a PhD candidate in English and Writing, Rhetoric, and Composition Studies at UC Davis. Her research explores how materialities of reading and writing technologies affect established and emerging writers' perceptions of reading and writing experiences. She works in her university's WAC program as a graduate writing fellow and also serves as a HASTAC Scholar. She blogs irregularly at www.jenaecohn.net and to get herself writing, she lights candles and dons the fuzziest of socks. Laura Gonzales is an Assistant Professor of Rhetoric and Writing Studies at the University of Texas, El Paso. Her research focuses on highlighting the benefits of linguistic diversity in professional and academic spaces.